The Spanish conquerors often used the Inca structures as foundations for their buildings because of their fine workmanship. This wall is done in the highest style, known as the Imperial Style, where huge stones were intricately carved to fit together without concrete, mud, or mortar of any kind. One stone in this wall has 12 sides. The Inca's ability to build with stone is well-known. But one of their most ambitious projects is rarely mentioned in the literature and is poorly investigated in the field. Probably no more than 150 miles in length, it cannot compare with China's Great Wall. Still, it is built at altitudes of 8,000-12,000 feet in extremely rugged terrain. It runs along high ridges and is studded with stone forts at strategic intervals. Even though the Inca Wall is only a few feet high, it would certainly slow down a force charging up precipitous terrain at two miles altitude. The true extent and condition of the Inca Wall is not accurately known. Only a few easily accessible sections have been checked out. The theory is that the Incas built it to discourage invasions by lowland Indians. Like all Great Walls, it seems to have met with only small success. Some of the best areas to see Inca Walls are along the streets of Loreto and Hatunrumiyoc. Inca walls line both sides of Loreto, which runs southeast from the Plaza de Armas. The south wall is from Amarucancha, site of the Palace of Huayna Capac. On the north side of Loreto is the wall which belonged to the Acllahuasi and is one of the oldest walls in Cusco. Hatunrumiyoc runs northeast from the Plaza de Armas. This pedestrian only street is famous for the 12 sided stone found along the east wall. To find the stone look for the souvenir sellers which set up regularly directly across from the stone. 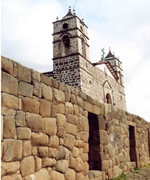 The Church of Santo Domingo, which is also the site of Coricancha is another great example of Inca stone work. A curved, 6m high Inca wall lines one end of the Church of Santo Domingo and can be seen from the street or inside the church.